Studio newborn sessions are perfect to document your baby's first few days of life in a more posed and artistic way. These sessions include edited, high-resolution digital files, and includes printing rights, so you're able to print where you'd like. Full sessions last 2-3 hours, and include many different set ups and props, full sessions include baby + immediate family members. Mini sessions are approximately 1 hour and is for baby only. All posed sessions are exclusively held in the Barrington, IL studio, and best documented before your baby is 3 weeks old. INDOOR SESSIONS ARE HELD AT OUR BARRINGTON, IL STUDIO LOCATION AND ARE PERFECT FOR CAPTURING CAKE SMASHES, MILESTONES, MATERNITY SESSIONS AND MORE. Most popularly booked, these unique shoots are offered in your home. 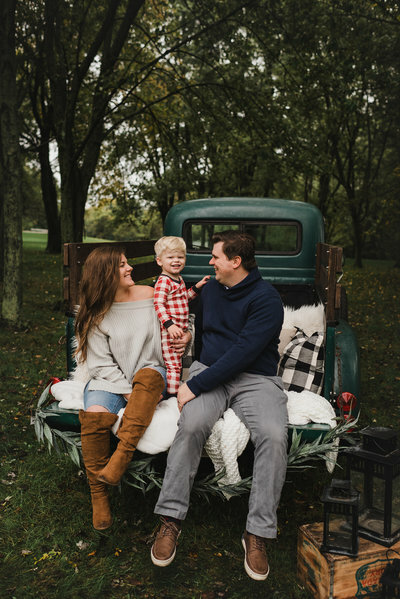 Whether capturing a newborn session, a special milestone, or "a day in the life", these sessions include candid images, documenting your days as parents, your children playing with their favorite toys, and more. A lifestyle session is between 1-2 hours. Edited images are presented in high-resolution with full printing rights so you can print where you'd like. This package includes your immediate family members, including your furry friends, too. Nominal travel fee may apply. NEED A RESUME OR LINKED IN PHOTO? PLEASE EMAIL KILEY@LITTLEBIRDIEPHOTOS.COM AND TELL US MORE ABOUT YOUR SPECIAL DAY. WE'LL HAPPILY REPLY WITH A CUSTOM PRICING PROPOSAL FOR YOU! Isn't she a purdy space?! Located at 232 E. Main Street in Barrington, Illinois, Little Birdie Photography is baby, child, family, and commercial photography studio. This boutique studio is parked just 40 miles northwest of Chicago, minutes off I-90. Resting right in the heart of downtown Barrington, LBP's 2200 square foot studio space is everything your heart could possibly desire. Original exposed brick walls and hard wood floors, big windows, in an open, airy space. Truly the best space around. Whether capturing an extended family session, baby milestone, or newborn's first few days of life, we offer both studio and natural light options, depending on your wants and needs. Concerned about props? There's an entire room dedicated to styling your studio session. Have a sibling you've gotta keep entertained during the session? Don't worry - there's a playroom! Sit back, relax, and grab a cup of joe while Little Birdie Photography gets the job done in this dream photography space. 5/5 Stars! Kiley is SO talented. She's great with kids, fabulous at editing, perfect with positioning and capturing NATURAL family moments! Best of all, her turnaround time is QUICK and she's so responsive. THANK YOU Kiley for being the best combination of professional and fun! We appreciate all of your hard work and will definitely be recommending you!!! "... TURNAROUND TIME IS QUICK AND SHE'S SO RESPONSIVE"
Simply put, LBP is in a special class of its own! Kiley did such a beautiful job of capturing our daughter's originality and heart melting smile. We couldn't be more pleased with the finished product and are already anticipating our next session. Kiley's talent speaks for itself (stop reading and go check out her galleries)! Aaaaand for the added bonus...expect to laugh a lot! Kiley is a professional at making everyone smile...and not just because that's her job. "FOR THE ADDED BONUS...EXPECT TO LAUGH A LOT"